Access Mechanical Handling are proud to offer the world renowned range of JCB forklifts to our customers in Scotland. JCB are renowned throughout the world as one of the largest and most reliable manufacturers of industrial and construction equipment. With a strong emphasis on research and development, JCB are great innovators in forklift technology and we are excited to be able to bring JCB industrial and rough terrain forklifts to our clients in Glasgow, Edinburgh and all over Scotland. There are three main ranges from the JCB forklifts range which we feel will be very popular with our clients in Glasgow, Edinburgh and across Scotland. These are Industrial Forklifts, Rough Terrain Forklifts and Telescopic Handlers. JCB innovation produced the groundbreaking Teletruk in 1997. The JCB Teletruk is a powerful telescopic forklift truck which utilises a telescopic boom rather than a vertical mast. This allows unrestricted forward visibility. The JCB Teletruk is a fork lift truck with a purpose : to reduce overheads, save time and space and improve site safety. For more information on how the JCB Teletruk can benefit your organisation please visit our JCB Industrial Forklifts page. JCB rough terrain forklifts offer a robust, dependable and easily operated answer to almost every material handling and logistics situation. Created with excellent mobility and superb productivity in rough terrain areas, there are 3 rough terrain forklifts in the JCB range. Lift capacities vary between 2.6 to 4 tonnes and lift heights vary between 3.6 and 6.7 metres. There are options of 4 different mast heights, each designed for excellent forward visibility with up to 18 degrees of forward tilt to assist load handling and placement. JCB’s innovative range of telescopic handlers offer the ideal solution for working in restricted height environments. The JCB tele-handler product range is fronted by the superb JCB 515-40. If you are seeking fantastic lift height, lift capacity and reach, from a compact machine with incredible manoeuvrability, it will be difficult to beat the JCB 515-40. 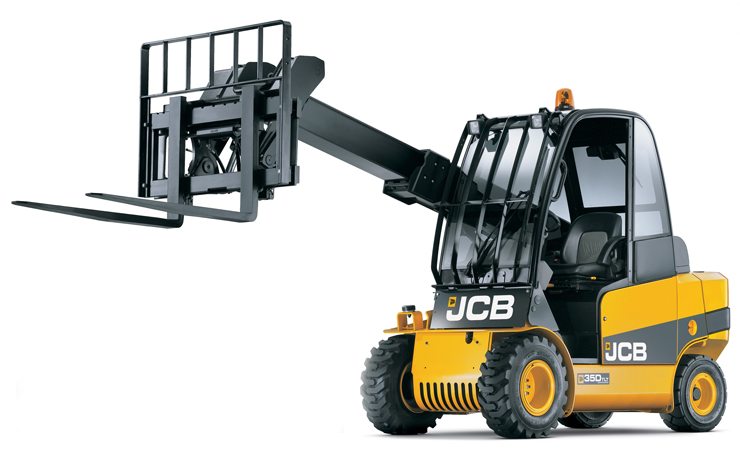 If you’re looking for forklifts in Glasgow, Edinburgh or any other part of Scotland, you can be sure that with the worldwide reputation of JCB and the excellent local service and after sales support you’ve come to expect from Access Mechanical Handling, you’ll be in safe hands. Give our Bellshill office a call today on 01698 745859 to find out more information or to arrange a free demonstration. Alternatively drop us a message on our contact page and we’ll get the ball rolling.